• Why risk derailment or ruptured hoses if the night switching crew doesn't notice that a car wheel is still chocked? Aldon flag wheel chocks are now available with quick flashing light and mounting bracket. 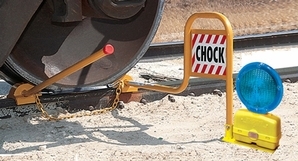 • Always use tarp strap (supplied with chock) to draw chocks against wheel. Replace strap if missing.